To Cite: Abouhamzeh B, Mirzaii-Dizgah I, Ravaei A. Serum Lysophosphatidic Acid Level in Chronic Myeloid Leukemia, Ann Mil Health Sci Res. 2017 ; 15(1):e62801. doi: 10.5812/amh.62801. Background: Chronic myeloid leukemia (CML) is one of the 4 types of leukemia that affects many people each year. This type of leukemia is associated with wide changes in the blood of patients. The aim of this study was to evaluate the serum level of lysophosphatidic acid (LPA) in patients with chronic myeloid leukemia. Methods: Blood samples were collected from 21 patients with CML and 21 healthy individuals. Serum LPA was measured by the enzyme linked immunosorbent assay (ELISA) method. The data were analyzed by student’s t-test. Results: The results showed that serum LPA level (nmol/mL) of patients (4.5 ± 0.7) was significantly more than the control group (2.2 ± 0.2) (P = 0.004). Conclusions: It seems that serum LPA levels increase in chronic myeloid leukemia, which may be considered as a biomarker in CML. Chronic myeloid leukemia (CML) is one of a variety of cancers of the blood. This kind of leukemia affects bone marrow cells or myelocytes that make up bone marrow tissues and has a chronic course. In this type of cancer, a disorder occurs in the regulation of the growth of myeloid cells in the bone marrow, which reduces all types of blood cells, including erythrocytes, myelocytes, granulocytes, and platelets. This disease occurs at an early age, and the underlying cause is still unclear. Statistics show that this cancer accounts for 15% to 20% of adult cancers, and in the United States 5980 people were infected in 2013 (1). Lysophosphatic acid (LPA) is an important biofilm phospholipid in various body tissues, such as serum, plasma, seminal fluid, and tears. The LPA is produced from a variety of cells, including endometrial cells, neurons, ovaries, and erythrocytes, which interact with G protein coupled- receptors (GPCRs) on cells. The GPCRs are the largest family of cellular message transmitter molecules that control important physiological functions, such as neuronal transmissions, release of enzymes and hormones from endocrine glands and exocrine, immune responses, smooth muscle contractions, and blood pressure regulation in the body. The GPCRs are expressed in proliferative cells and play a role in tissue rearrangement, tissue repair, inflammation, angiogenesis, normal, and cancerous cell growth. Many potent mitogens, including bioactive lipids, such as LPA, activate these receptors and promote cellular proliferation out of cell control by enhancing the cell cycle, inhibiting apoptosis, and inhibiting cell differentiation. By acting on its receptors, LPA stimulates further release of LPA, and thus, by creating an autocrine cycle, it causes growth outside the control of cancerous cells. The LPA is also secreted by cancerous cells that triggers repeated expression of sensitive GPCRs in these cells, which results in excessive expression of these receptors and increases growth, survival, and resistance to chemotherapy (2-4). The amount of LPA in the plasma of patients with ovarian cancer is significantly higher than that of healthy people. Today, LPA is a potential biomarker for ovarian cancer (5). Acute Myeloid Leukemia is reported to increase the production of LPA via Autotaxin (ATX), reducing control over the growth of blood cells and increasing their migration after bleeding. These factors contribute to the pathogenesis of AML (6). Plasma levels of LPA are considered as an appropriate biomarker for the diagnosis of colorectal cancer. Studies have also shown that the expression of LPA receptor in colorectal cancer cells is altered as compared to normal cells, which indicates the role of these receptors in the formation of tumor cells in colorectal cancer (7). Obesity is one of the risk factors for many cancers, including breast cancer, colorectal, and ovaries (8). A study on height, weight, and nutrition in patients with CML has shown that increased BMI and reduced motility could increase the risk of this type of cancer, which indicate a possible association between obesity and this cancer (9). The mechanism of communication between obesity and various cancers is still unclear, yet observations show that this relationship could be achieved by changing the energy balance, growth factors, and various signaling pathways of the cell, such as PI3K / Akt / mTOR (8). Studies have shown that ATX, an enzyme that produces LPA and increases obesity, is secreted from adipose tissue and, by increasing LPA, causes insulin resistance and inhibition of insulin secretion (10). Considering that to our knowledge there was no report about the amount of LPA in CML and also due to high levels of LPA in the mentioned cancers, the aim of this study was to determine serum LPA levels in patients with CML. The ethics committee of the AJA University of Medical Sciences approved the study plan (IR.AJAUMS.REC.1396.25). At all stages of the research, the names and identities of the subjects were considered confidential and the results were published without names and specifications. In this study, all enrolled patients were male and did not have any lipid metabolism like diabetes-related illnesses and did not consume any drugs that interfere with the metabolism of lipids and carbohydrates. A total of 21 patients with CML, who referred to Imam Reza (in Tehran) and Imam Khomeini (in Tabriz) hospitals and 21 healthy individuals were enrolled in the study. Data on height, weight, and history of chemotherapy were recorded. The 2 groups were matched for age and body mass index. To measure serum LPA levels, 5 mL of fasting venous blood was taken. The serum was separated by centrifugation at 3000 rpm for 10 minutes and stored at -70°C. The measurement of serum LPA samples was carried out using the enzyme linked immunosorbent assay (ELISA) Kit manufactured by ZellBio Company in Germany under catalog number ZB-3406-H9648, according to the manufacturer’s instructions. All data were expressed as mean ± standard error of the mean (SEM). For statistical analysis of the data, SPSS16 software (SPSS Inc., Chicago, IL, USA) and unpaired Student’s t-test, and Pearson correlation tests were used. To calculate the cut-off point, receiver operating characteristic (ROC) was used and P < 0.05 was reflected as statistically significant. There were no significant differences amongst groups in mean age (CML group: 55.3 ± 2.3 years; control group: 53.3 ± 3.3 years, P = 0.621) and BMI (CML group: 26.6 ± 0.05; control group: 25.6 ± 0.6, P = 0.621). The mean serum LPA levels (nmol/mL) of control subjects (2.2 ± 0.2) was significantly lower than the CML group (4.2 ± 0.7) (P = 0.004) (Figure 1). Data are expressed as mean ± SEM and * indicates a significant difference with P < 0.05. Serum LPA had no significant correlation with age (r = 0.154; 0.341) and also with BMI (r = 0.203; 0.209). The amount of cut-off lysophosphatic acid for CML was calculated as 3.04 nmol/mL; with this level, the area under the ROC curve was 0.925, the sensitivity was 81%, and the specificity was 95%. The objective of this study was to assess the serum level of lysophosphatidic acid in chronic myeloid leukemia. In this study, there was a significant difference in the serum levels of LPA between patient and control groups, which was higher in patients with CML than in healthy subjects. This result has been observed by many studies of other cancers (11, 12). The progression of cancer is associated with disorder in many cellular processes that include proliferation, growth, survival, migration, cellular invasion, and increased angiogenesis. It is observed that the LPA is involved in any of these processes (13). The LPA, according to reports, acts as a growth factor in B cells and increases cell proliferation and intracellular calcium, and forms immunoglobulins. The LPA has been shown to increase in the blood and peritoneum of patients with ovarian cancer (14) and protects ovarian cancer cells against chemical drugs that induce apoptosis (15). The LPA is a potential gene expression mediator, particularly in cancer cells. The LPA targets genes that are involved in inflammation, angiogenesis, and tumor progression, such as Interleukin (IL)-6 (2), IL-8 (2), growth-regulated oncogene alpha (16), cyclooxygenase-2 (17), VEGF (18), and urokinase plasminogen activator (19). The VEGE, recognized as a vascular permeability factor, is one of the most powerful angiogenic factors in tumors (20). The mRNA and VEGF protein are widely expressed in malignant tumors, including ovarian cancer (20). During increased vascular penetrability, VEGF plays an important role in ascites formation in ovarian cancer (21). Moreover, increased expression of VEGF is associated with tumor growth and poor diagnosis of numerous tumors. The LPA induces VEGF expression in ovarian cancer cell lines and other cancers (3). Because ascites in ovarian cancer is a LPA-rich environment (22), the ability of LPA to regulate the expression of VEGF affects the role of LPA in regulating the expression of VEGF in cancer patients. The LPA activates VEGF expression in ovarian cancer cells by induction and activation of HIF-1α (3). Another study showed the relationship between oxygen deficiency in tissues and LPA in regulating gene expression and other cellular responses (23). The LPA also increases the expression of urokinase-type plasminogen activator (uPA) and matrix metalloproteases (MMPs), which are important mediators of metastasis and invasion (24). The LPA, via Rho/ROCK/actomyosin and Ras/MEKK1, increases the formation of local conjunctiva and increases the migration of cancer cells (25). Similar effects have also been observed in other cancers, including cancers of the stomach, colon, prostate, pancreas, and liver (4, 26). There are at least 2 main paths for LPA production. The first pathway is hydrolysis of phosphatidic acid by phospholipase A1 and A2. It is believed that this pathway operates mainly in the cell or on the cell membrane where the phosphatidic acids are located (27). The second route is hydrolysis of lysophospholipids, such as lysophosphatidyl choline and isophosphatidyl serine by lysophospholipase ATX/D. There are other pathways that could produce LPA: glycerol 3-phosphate acylation by glycerophosphate acyl transferase and monoacyl glycerol phosphorylation by monoacyl glycerol kinase. However, the LPA produced by these 2 routes seems to be used as glycerol lipid synthesis precursors rather than a source for extracellular signal molecules (28). Responsible for production of LPA in blood is ATX, which is known as lysophospholipase D (29). In most cancers, ATX secretion is responsible for their invasive properties. ATX is among the very highly regulated genes in highly metastatic cancers (30). Therefore, the targeting of LPA and ATX as cancer enhancers for the treatment of this disease could be considered. 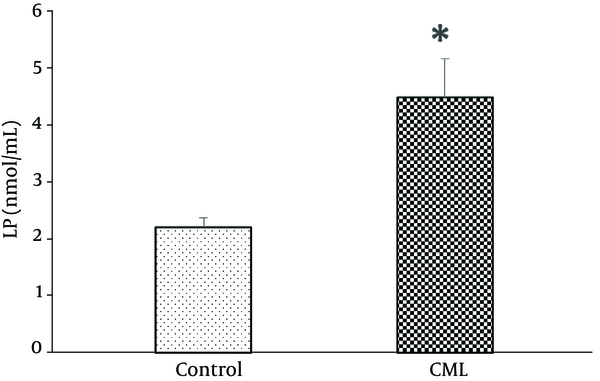 The serum LPA level increases in chronic myeloid leukemia, which may be considered as a biomarker in the CML.